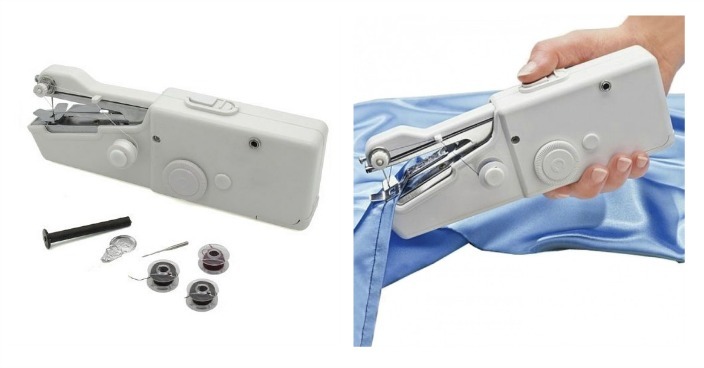 Handheld Sewing Machine Just $9.99! Down From $40! Ships FREE! You are here: Home / Great Deals / Handheld Sewing Machine Just $9.99! Down From $40! Ships FREE! GearXS has this Handheld Sewing Machine on sale for $9.99 (Reg. $40) + FREE shipping! This compact sewing machine will save you from the worst of fashion disasters. With its handheld, comfortable design, you can fix any tear or even add embellishments on the go from the convenience of your purse. Battery operation makes it possible to use anywhere, from car to home and even the office! This is a handy necessity for fashionistas and anybody who enjoys crafts.